How can a regulatory committee sue someone else in another country that has different country laws…? A man in one place says do what he says and another man elsewhere says do what I say or else, Smh. This is why I believe in natural law. Market orders are marked as such. I believe… Unless somebody has something better with MT4. ??? See , get it ??? So if they (CCM ) say its complicated , lol , if this is the real truth ,yea is dam complicated ! We withdrew over 10K from CCM by wire right after our accounts were transferred. us stick to the facts only. Pleez, Clint !!! I agree. Let’s avoid creating fake facts. In particular, let’s not confuse CCM with Tallinex. 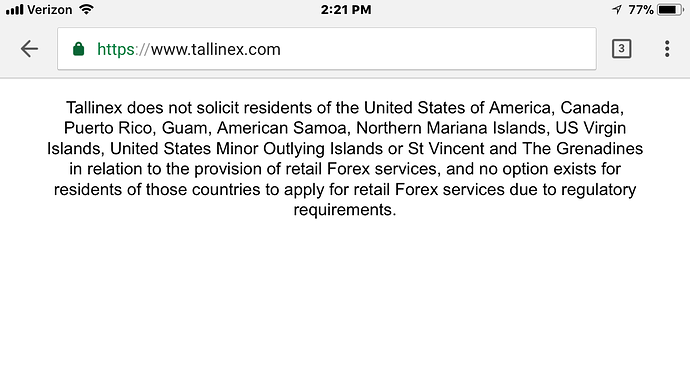 According to Tallinex, there is no continuing business relationship of any kind between the two brokers. When Tallinex came under attack by the U.S. authorities – culminating in the SUIT mentioned above – Tallinex transferred the accounts of all of their U.S. clients to CCM. No business relationship existed between Tallinex and CCM prior to that transfer, and no business relationship has existed between them since the transfer. At the time of the transfer, as Tallinex was in the process of severing all ties with the U.S. market, the choice of CCM (as opposed to some other broker) was a matter of convenience for Tallinex. Therefore, CCM is not a party to the U.S. government’s suit against Tallinex. And so far, CCM is not a target of the U.S. government on their own account. I don’t have many facts to stick to. Like all of you, I’m waiting for facts. Specifically, I’m waiting to hear from members of this forum who are clients of CCM whether they have had any success in retrieving their lost deposits; and I’m waiting to hear from CCM that they have established a relationship with a reputable PSP, and have taken steps to ensure that this sort of deposit problem will not happen again in the future. There is one thing I can add to the discussion at this time – the email reply which I received from CCM (which I initially said that I would not post). Very early on Tuesday, October 24, I sent an email to CCM in which I made several statements and asked several questions. I posted that email HERE. A few hours later, CCM replied to my email, refuting the statements I had made, and offering answers to my questions. I posted HERE that I had received the CCM email, and that I would not be posting it here in this thread at the present time. I have changed my mind about that. Below is a copy of CCM’s reply to my email. Note the last paragraph of their reply, in which they allude to the conspiracy-theory issue – although they don’t use that term. Also note that the abbreviation PSP in the CCM email stands for “payment services provider”. I mentioned in THIS POST the possibility of placing a WARNING on the Capital City Markets listing in The Offshore Broker List, but I said that I considered it premature (at that time). In view of the fact that we might be looking at months before some of our members are able to resolve their deposit problems with CCM, I think a WARNING is appropriate, and I will add it this weekend. This email response from the Admin of Capital City Markets is riddled with red flags . The first email to us traders was ridiculously unclear with no apparent reasons. My return response email to CCM stated that they have not made one bit of sense . Then they did not respond for over 24 hours ! Not minutes or hours and they do not allow a chat feature. Personally I have not received my funds back instantly from my bank , in fact they have not gotten back to me after I went in with all my electronic communication and deposit info with a lengthy process ordeal ( 4 hours ) . The admin of CCM goes on to say it is not highly suspicious , though financial fraud experts that do this for a living say that would be a lie. Further it begs to be answered , after all this time (months) WHOSE MONEY HAVE WE BEEN TRADING IF IT NEVER WAS RECIEVED ? have at least a handful of brokers who are willing to work with U.S. persons?? "compliance" is defined to be by CFTC). I read through the REDList at the link provided by HyperScalper and I did not see LMFX, although I did see the other 3 Trusted Brokers currently shown in the Group 1 list. Maybe I somehow missed seeing it and maybe there is nothing significant about that broker not being on the list, yet. I also noted the sentence at the link stating “The goal of this list is to provide information to U.S. consumers about foreign entities that are acting in an unregistered capacity and to help them make more informed decisions about whether to trade with or through such an entity.” To me, that sentence makes it clear that I can trade with those entities if I choose. I realize this must have been discussed many many times here and elsewhere, but it was one of those things I wanted to track down and actually see in writing. Sorry to get off subject. On the contrary, isn’t this absolutely “on topic” ??? In the description of offshore brokers, the spread is shown, but it happens rarely that anyone discusses carry trade here. Obviously, a person like hyperscalper (who does most of the analysis for spreads) does not care that much about carry trades. However surely there are people who trade on longer term. I would like to ask if anyone knows which of those brokers have the best carry trades? Or is there a thread which discusses current carry trades for brokers (I mean not something that was active 10 years ago, but now in the present). I know this is not definitely an offshore question as I am looking for any good carry trade brokers, but it is a good starting point to know what you guys think of the brokers which you have tried. hours, well within their advertised 24 hour window. members will know, one Big Issue is with BitCoin Transaction rates. transaction fee, is just “getting used to” working with BitCoin. decrease BTC confirmation transaction rates !! In my case, using CoinBase, obtain a “receive” wallet address. "expire" because you have failed to check your email. Then WAIT. Up to 24 hours until status goes from queued to complete. and “instantly” receive USD in a wallet at CoinBase (in my case). Then request transfer to your linked Bank, which takes 1-2 days. Voila! You have withdrawn into USD which you can spend !! !